Caring for your Kokedama is easy. Follow these steps to keep your Kokedama healthy and content. 1. Feel the weight of the Kokedama. If it feels light in weight it’s time for watering. (Generally, succulent Kokedama’s will only require watering every few weeks). 2. Place the Kokedama in an empty container and gently fill it with room temperature water so it covers 1/3 to 1/2 of the Kokedama ball. 3. Let the Kokedama sit for approximately 10 minutes to absorb the water. 4. Remove the Kokedama from the container and drain excess water for a few minutes. When it has finished dripping it is ready for display. 5. Keep your Kokedama in a well lit bright position until you water again. Tip for succulent Kokedama’s – When in doubt it is better to under water than over water. Succulents are hardy, require little moisture and prefer dry conditions. Swiss Cheese Plants (Monstera Deliciosa) originate from the humid tropical rainforests of Mexico. In their natural habitat they grow up tree trunks in search of light, but in pots they are slower growing. Their common name comes from the slits in their dark green leaves. These plants are a favorite of ours as they are peculiar looking and make a great statement piece in any room but best of all they are easy to care for. Light – The Swiss Cheese Plant prefers bright indirect light. It will not tolerate direct sunlight and the leaves may begin to yellow. Not enough light can slow growth down. A bright well lit living room or bedroom would be an ideal spot. Water – Water weekly, or whenever the top 1 inch of soil feels dry, and allow it to drain completely. Humidity – Prefers humidity and a warm environment. Never let soil dry completely. Mist leaves with a spray bottle. Fertilize – These plants like to be fertilized once a month with a diluted solution during the growing seasons (summer + spring). 1. It is easy to grow – it virtually thrives on neglect. 2. Its glossy, Swiss-cheese like leaves make a naturally beautiful statement in any style of home. 3. They can be grown big or small making them perfect for both tiny apartments or large open-plan homes. Looking for a “Swiss Cheese Plant” Gift? Visit our Shop to see our range. The Fiddle Leaf Fig is rapidly becoming Australia’s most popular indoor plant. It has attractive, big glossy leaves and is a low maintenance evergreen plant that is troubled by few pests. A truly beautiful feature piece for the home or office, it is easy to see why it has grown so quickly in popularity. Follow our tips below to keep your fiddle leaf fig fit as a fiddle. The fiddle leaf thrives indoors in a well-lit position away from direct sunlight. Generally, the fiddle leaf fig enjoys the kind of bright light environment most houses and apartments provide. The fiddle leaf fig prefers some humidity and will tolerate indoor temperatures just fine. To ensure even growth, rotate the plant every on occasion. Your Fiddle Leaf Fig should only be watered when the surface of the potting mix becomes dry. When watering give it a drenching so water is draining from the bottom of the pot and leave it to slowly dry out again. Fiddle Leaf Figs enjoy consistent watering to keep them moist but not soggy. Water well during the growing season (spring and summer) and reduce watering in the cooler months. Don’t let your plant sit in too much water as it may develop root rot. If you notice the leaves are limp and floppy you are probably under watering your Fiddle Leaf Fig. Brown spots on the leaves are generally related to too much water. Managing soil moisture is critical to success with Fiddle Leaf Figs. Grow plants in a rich, well-drained potting mix including part bark and perlite. It’s generally time to re-pot your Fiddle Leaf Fig when the roots are growing out of the drainage holes. When your Fiddle Leaf Fig is still small and growing rapidly, you may need to re-pot it every year. Liquid fertiliser application monthly during the growing season (spring and summer )will ensure vigorous growth. Wipe the leaves of your Fiddle Leaf Fig regularly with a soft cloth to remove dust and improve the glossy appearance. Dust can affect the pores of the leaves and make it difficult for the leaves to function. Looking for a Fiddle Leaf Fig for a Gift? Check out our SHOP to see our latest range of plant gifts. Looking for a perfect plant gift? Why not give that special someone a Succulent Plant to brighten up their day. Succulents make great gifts as they require little water and a nice sunny spot to keep them happy. Simple right! Succulents store water in their leaves and tend to have thick, fleshy foliage. They are very diverse plants with many types of colours, shapes, and blooms. Succulents are suitable for growing indoor and outdoors and extremely adaptable to harsh climates. We are obsessed with Succulent plants at the moment because they are perfectly suited to container growing and look fantastic in pots. Succulents are superbly adapted to a hot dry climate. They love full sun, little water, and thrive on neglect. They are a popular plant that varies in colour, height and foliage. There are thousands of different varieties available. 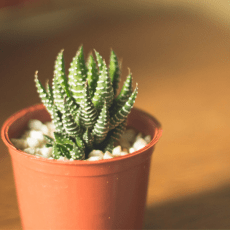 We recommend you place your succulent plant in a pot, in a well-lit spot in the house or on the patio. Check out our shop to find our beautiful range of succulents, a beautiful potted plant gift delivered to your door. Succulents are everywhere right now and for good reason. Succulents are extremely versatile and there are so many varieties available with rich hues and textures. This succulent frame planter is a great weekend DIY project and is so easy to put together. The final result is simply stunning and would make the perfect succulent gift. Watch the video below for instructions. Succulents are easy to propagate and a fun project for the inexperienced gardener. With so many gorgeous varieties of succulents available they are the perfect plant to propagate and enjoy in your garden or home. Step 1. Snap off a leaf from a succulent ensuring you make a clean break off the stem of the succulent plant. Step 2. Place the leaf in an undercover area in the sun for three days to a week. A callus will form on the base of the leaf where the roots will grow. Step 3. Once the tiny roots have started to form, replant into pots with drainage holes with good quality succulent potting mix. Water. Step 4. Keep the pots in a sunny spot and water every one to two weeks making sure the potting mix is completely dried out before watering again. In a few months you will have a brand new succulent plant. The Zebra Plant (Haworthia fasciata) is a low maintenance compact and visually appealing succulent. It has green triangular clustered leaves with white stripes which gives it the Zebra effect. This succulent looks fantastic in an unusual containers and is great for the office or home and makes a lovely gift. 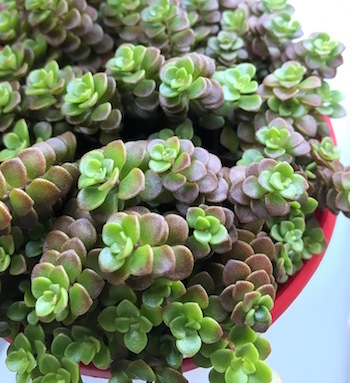 This dainty little succulent is very slow growing, drought tolerant and if conditions are perfect it will produce little white flowers during summer. Water – The Zebra Plant usually requires watering every few months in the winter and every three weeks in the summer. Water only when soil is completely dry. A ¼ of a cup is usually sufficient. Sunlight – The Zebra Plant’s ideal conditions are bright indirect sunlight, however they can survive well with minimal light. Inspect your plant every few weeks for signs of pests or scale. If you notice any nasty bugs, spray the plant with a soapy dish washing mix for two weeks until cured. Terrariums are perfect for a unique and personalised gift and easy to create yourself. Plant Terrariums are a gorgeous addition to your home or office and look beautiful as wedding favors. 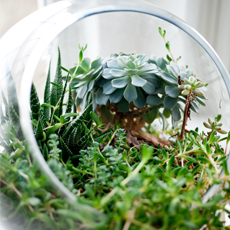 Terrariums are easy to create and can be made in all shapes and sizes. Follow our simple step by step guide to learn how to create your own terrarium gift for friends and family. Choose your container. Any style of glass vase or jar that you like is suitable. Fish bowls and apothecary jars are a popular option. Add a layer of sand to the bottom of the terrarium, this can be purchased from your local hardware store. Beach sand is not recommended as it contains bacteria and can harm your plants. Cover with some smaller pebbles or stones. Add a layer of activated charcoal. This can be hidden in the rocks if you don’t want it visible. Simply create a small well in the rocks to place it. Place a layer of sphagnum moss over the charcoal layer. Cover the sphagnum moss with a final layer of good quality potting soil suitable for the plants you are using. Speak to your local hardware store or nursery if you are unsure. Add plants and decorate with ornaments or shells. Succulents are a great plant for terrariums. They come in many colours, shapes, and sizes, require little watering, and a will be happy in direct sunlight as well as filtered light. Small indoor plants are another excellent option for your terrarium. Looking for a gorgeous Terrarium gift delivered in Brisbane? Check out our SHOP to see our latest range of plant gifts.